You. Yeah you with the sore thumbs. You're not a typical shopper, are you? Nope. You're a Sony Entertainment Network user. In other words…you're smart. Not only can you download the latest and greatest PlayStation video games right from the warm and cozy comfort of your living room couch, but you can also pick up game add-ons, themes, Hollywood movies and even TV episodes. Pretty sweet deal. And speaking of deals, they don't come much sweeter than this. 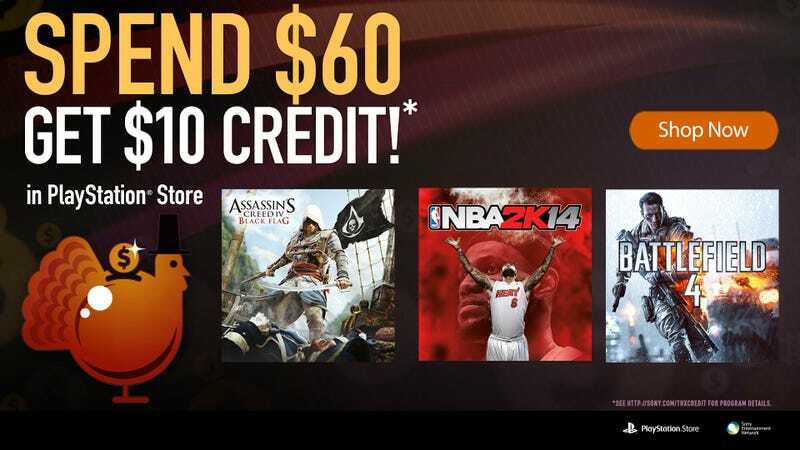 From November 26 to December 3, 2013, spend just $60 in the PlayStation Store and get yourself $10 credit! With the holidays fast approaching, Sony's spreading the cheer by offering up its annual fall program once again. So which items qualify? Almost all of them! Any product you can snag at the PlayStation Store using your SEN wallet counts. That includes complete games, indie games, movies, TV shows and more. This offer's good on the PS3, PS4, PS Vita, and web stores, plus you can use it for membership services like Music Unlimited and PlayStation Plus. Think you can't combine it with any super-priced games in the Black Friday Flash Sale? Think again! Same for any Day 1 Digital games like Grand Theft Auto V, Assassin's Creed IV Black Flag, Battlefield 4, Batman Arkham Origins and more. They all qualify! So roll yourself out of bed, pull your SEN wallet out of your digital back pocket and kick off the holiday season with the perfect gift just for you! So roll yourself out of bed, pull your SEN wallet out of your digital back pocket and head here to kick off the holiday season with the perfect gift just for you!